Agent! You’ve been summoned by the team to help in a task of key importance! The great confectionary of the virtual realm seems to pride in its freshly glazed treats… but not for long. The team has organised a heist and you are going to lead the group towards the colossal reel of Cosmic Candy Heist Slot. Created by Pariplay, those sweet delights enclose some exciting flavours and sensations. Do you have what it takes to have the candies in your pockets at the end of your session on Cosmic Candy Heist Slot? Time to check that out, agent. Over and out! To begin your mission on Cosmic Candy Heist Slot, you’ll need to log into your Moon Games account. This game can be played on any device of your choice including mobile and tablet. This exceptional slot game is actually based on your skills. You will need to swipe left or right, up or down to match three or more candy symbols. Once a winning combination is obtained, you are awarded the wins and the symbols disappear, only to be replaced by new ones. Ready to put your skills at the test? Bet Levels: There are no bet levels on Cosmic Candy Heist Slot. Amount of Paylines Selection: There are no pay lines on this game by Pariplay. Wins are awarded when you line symbols anywhere on the reels. Coin Values: Yes, you can choose your desired bets on Cosmic Candy Heist Slot. You can choose from £1 up to £250 at the beginning of the round. You will be awarded 60 seconds per round. Once 60 seconds are over, the round is completed and all your wins are paid. You can then choose to continue playing with your wins or cash out. While playing, you can be awarded Rockets Symbols on the reels of Cosmic Candy Heist Slot. If you manage to complete a winning combination where the Rocket Symbol lies, you are rewarded with it. What is the use of rockets, you ask? Well, Rockets award multipliers. The more rockets you’ll collect the more multipliers you’ll benefit with. Up to 25x multipliers can be won through this feature. Notice the meter at the left side of the reels? By collecting rockets, you increase the meter arrow as well. If you obtain more than 8 rockets, you activate the Mystery Box feature. A mystery box will be dropped and these can award up to 250x multipliers. Awesome, right? Just like the rockets symbol on Cosmic Candy Heist Slot, you can obtain Tokens as well. Lining a winning combination where a token symbol lies will reward you with it. Gather enough tokens to purchase power-ups. There are three power-ups purchasable at different prices. You can buy the Monster Bite Power-Up. This will remove a line of symbols on the reels. You can buy the Cherry Bomb Power-Up. This explodes a big chunk of symbols on the reels. You can buy the Time Power-Up. You will have an additional 15 seconds added to the round. 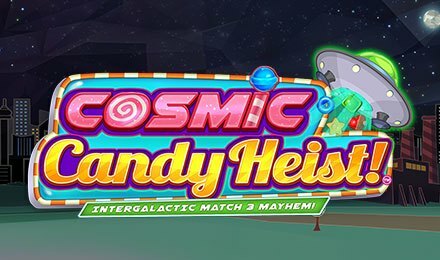 Prepared to excel in your Cosmic Candy Heist Slot mission? Good luck, agent!